We don’t do book reviews here. It’s far beyond our remit and, in any case, where would we start? Yesterday’s railways have spawned so many of them. But every rule has its exception and this one is driven by the subject matter being close to home, both personally and geographically. That the book takes us on a unique journey along a fabulously engineered (and long since lost) line is, of course, a bonus. The first in a series entitled Great Northern Outpost, it photographically chronicles the latter days of the meandering branch to Thornton, in the hills west of Bradford. This formed part of what became known as ‘The Queensbury Lines’ and a second volume - to appear later this year - will include the section from Halifax to Queensbury, as well as the Keighley extension. Thus we’ll have many more structures to awe at. So what makes this book stand out? Yes, the nostalgia is classic - the solitary signalman tugging at a lever, rained-soaked platforms where only a dog waits, the District Engineer’s saloon retreating over a viaduct. Evocative imagery for sure, but elsewhere you’d tend to find it in black and white. Here though, every one of the 110 pictures is colour and, without seeing them, it’s difficult to appreciate the extra dimension that brings. A J39 shunts in Thornton yard in 1962. Responsible for pulling everything together are Alan Whitaker, whose father served as Station Master at Thornton, and Jan Rapacz with his childhood memories of the line, having grown up at Great Horton. It’s been years in the making, such is the dearth of colour material and the time needed to research it. The comprehensive captions offer much insight. But greatest credit must go to the enthusiasts who captured the scenes on what, at the time, must have been eye-wateringly expensive camera equipment. The predominant collection is that of David Mitchell who clearly had an eye for locomotives; we must though also be thankful to John Rothera and the striking infrastructure views he caught. It’s difficult to follow the alignment today, such was the vigour with which it was reclaimed after closure and the nature of subsequent development. The book is hugely valuable in that respect, revealing the challenge faced by engineer John Fraser in threading the railway through what, in the 1870s, was already considerable urban sprawl. The topography and geology didn’t help much either. 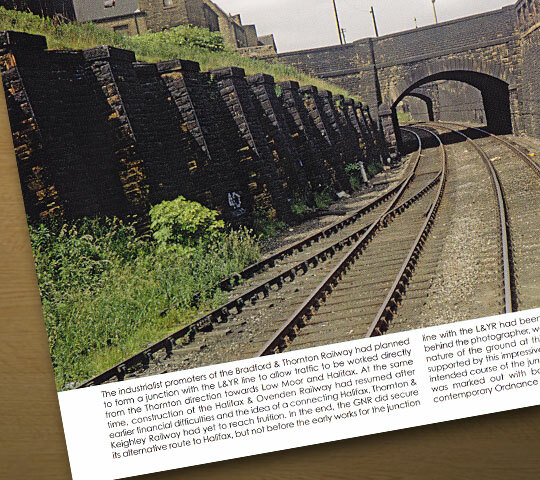 Whilst passenger services originated from Bradford Exchange, the line proper started at St Dunstan’s, thereafter diving under the Lancashire & Yorkshire’s route to Halifax before entering a cutting, supported by vertical retaining walls, one side being heavily buttressed. There is a sense that the railway was almost invisible - hidden away in cuttings - except at the stations where expansive goods yards gobbled a few acres. A buttressed retaining wall near Upper Castle Street, Bradford. 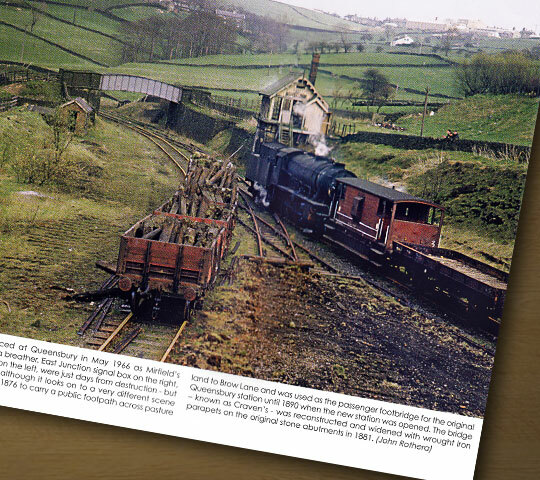 Featuring regularly throughout the book are stalwarts of Low Moor shed which succumbed to the outbreak of diesel in 1967. Black 5, B1, J39, WD Austerity: grimy workhorses pictured on freight duties. We venture down the City Goods branch to find a Class 8 shunter going about its business. A coal merchant (remember them?) picks up his consignment from a double bank of coal drops. And particularly rare is a find from 1954 showing a Halifax-bound passenger train pausing at Queensbury’s even-rarer triangular station. It’s the structures though that grab my attention - all of them built with permanence in mind but mostly demolished since the plug was pulled in 1965. We see the station booking office straddling the railway at Manchester Road, the adjacent tunnel - now buried - and elegant masonry overbridges, often at jaunty angles. Thornton’s eye-catching viaduct bucked the trend, its 20 spans surviving to acquire a Grade II listing. As Bradford was left behind, the line broke cover to mount substantial embankments. But as Queensbury beckoned, it disappeared again into the 1,057-yard Clayton Tunnel. Accompanied by his four-legged friend, Bert Perry evaded dagger-like icicles to snap a view looking out into the deep, snow-covered approach cutting. This is now backfilled and topped with bungalows. Adding great character to many of the pictures are the line’s signal boxes. Viewed from the 21st century - where the emerging norm is for soulless, distant control rooms - there is something deliciously charming about them. Two are worth highlighting: the first stood sentinel on the island platform at Great Horton - cantilevered out over the Goods Loop - whilst the second, Queensbury East, settled perfectly into the surrounding pastureland. Track lifting is well advanced at Queensbury in May 1966. Journey’s end is at Thornton where the yard remained busy well into the Sixties; indeed it was profitable - attracting new business - until BR management contrived to destroy it by ending timber and livestock feed movements. And so the book ends with salvage crews finishing what nature had, in reality, already begun - the process of reclamation. It’s all very melancholy. The western end of the Bradford & Thornton Railway is now preserved as the Great Northern Railway Trail; east of Queensbury there’s not much left. So the book reminds us of it, lest we forget the GN’s considerable endeavours in reaching out to places previously unconnected. By doing so in colour, the book draws its readers into believing that the scenes are relatively recent. A couple of shots showing Thornton Viaduct could have been taken yesterday, were it not for the locomotive and its pall of smoke. This was though 50-plus years ago - a very different time - when chimneys and telegraph poles broke the skyline. It certainly whets the appetite for Volume 2. 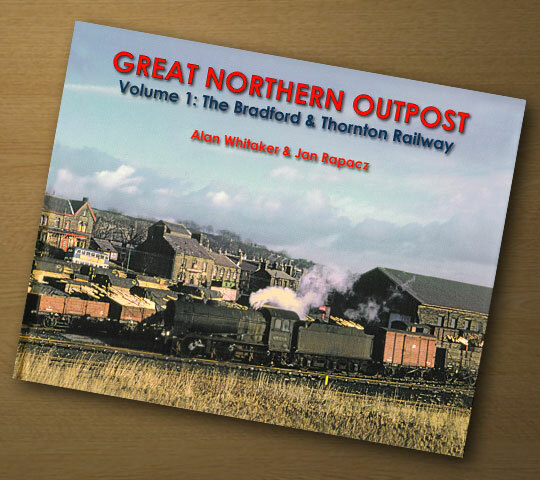 Great Northern Outpost Volume 1: The Bradford & Thornton Railway is brought to us by Willowherb Publishing and is available via its website (click here to visit the Buy Now page), priced £19.95.